EvenNode provides up-to-date and monitored environment to deploy apps written in Node.js or Python. You can pick the latest or any older version of a programming language of your choice which suits your needs. Take advantage of popular MongoDB, the leading NoSQL database. Every app gets access to one free database which can be used to store persistent data, uploaded assets, application logs, etc. 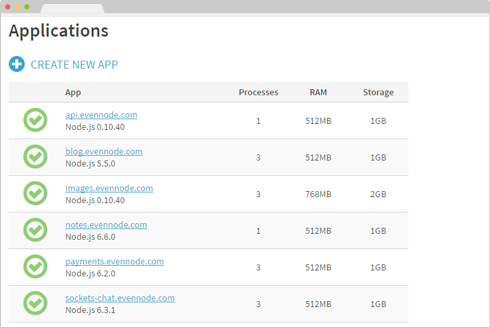 It's easy to scale your app with EvenNode – simply enable additional processes and we will automatically route requests to all your active app instances. Manage your app easily from the web browser. Our web console provides features to help you get up and running and to monitor and manager your app during its lifecycle. Monitor usage of CPU and memory directly from the web console. All apps get access to their resource usage report over the last weeks to discover if it's time for upgrade. Incoming traffic is automatically routed across all running processes to spread load and provide higher throughput needed to serve requests. Background jobs help you run a scheduled job without blocking your app's process. Simply create a separate process and run the job in background. Assign unlimited number of custom domains to your app. We even support wildcard subdomains which route traffic to your app from any subdomain on your main domain. Push changes to your app easily through git deployment. During the push we automatically install all dependencies and restart the application for you. We're based in Europe with servers located in Europe and United States so that all customers can enjoy low latency to their applications.